You know it's going to be an unusual day when you wake up to strains of the song The Wichita Lineman running through your head. This happens when your husband mistakenly has the digital radio programmed to Easy Listening instead of the usual Smooth Jazz or Pop Standards station right before you go to sleep. I had not planned to start the morning with Glenn Campbell; it was just one of a few little surprises to start my day. I have categorized them for you, dear readers, to give you a little glimpse into the nature and variety of a day's surprises. Literary Surprises Are you bi-literate? Do you often read two books at a time? Don't you just love it when Book A (In this case Bird by Bird by Anne Lamott) is alluded to in Book B (What to Where For the Rest of Your Life by Kim Johnson Gross)? Two completely and absolutely different types of books and reading experiences......connected. I love it when that happens. My favorite example of this was when I was reading A Writer's Diary by Virginia Woolf and was concurrently picking through VITA AND HAROLD, The Letters of Vita Sackville-West and Harold Nicolson..............and discovered, quite surprisingly, in the course of reading that the two were lovers for a period of time. I guess I was the last to know. Garden Surprises Just when you thought all of the Amaranthus tricolor (Joseph's Coat) seed that you bought at the Monticello Gift Store last fall had washed away in the great flood, you spot.........what?.......what is that?? ?........well, if it isn't that gaudy colored Joseph's Coat I planted earlier this spring. Only one made it, but oh does that make it special. Then there are the naked ladies that never fail to shock me each summer. First by their very appearance (I always forget about them), and then, well.........by there unapologetic nakedness. soon a whole friggin' nudist colony is prancing about in nothing but their...... stems! Shocking! I mean, really I thought this was a prim and proper.........English Garden. this little white apron on. Hmmmmmm. Trying to decide which I like better, naked ladies or naked husband. Cast your ballot please. When was the last time you had a surprise from this category? Well pardner........... that's too long! Surprise Gifts A friend of mine recently moved to Asheville, N. C. and I'm sure was ever so sad to leave her Birmingham garden behind. 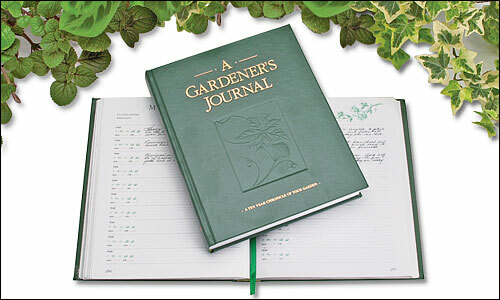 To ease the pain (and because I knew she would be so surprised) I sent her a housewarming gift of a beautiful leather- bound, ten-year garden journal from the Lee Valley Catalog. to pass down to my gardening progeny. I've been bad, and have stuffed mine with so many pictures and tear-out sheets that I am probably ruining its binding. I should know better, dang it. Zen Surprises Finally, I was surprised to get this post from Zen Habits espousing the merits of NOT being goal oriented. Surprisingly common-sensical.